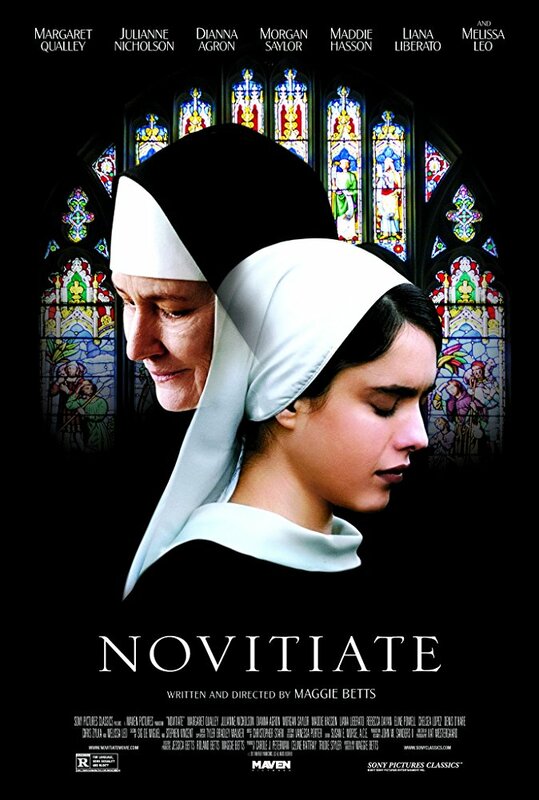 From beginning to end, Novitiate stirs a flood of questions and reactions. Because the movie is so beautifully filmed, acted, written, and directed, the audience is free to think only about the compelling issues raised. That earns a salute for writer/director Margaret Betts who avoids all the excesses that might have weakened the film. Part of the movie unfolds before the Vatican II conference called by Pope John XXIII in 1962 to address the spiritual renewal of the Catholic Church in the modern world, the first such assessment in 100 years. Part two unfolds after the conference as we watch Mother Superior Marie St. Claire (Melissa Leo) cling to the principles she has been teaching for forty years. Upset by her parents’ vicious arguments, young Cathleen (Margaret Qualley) tells her mother Nora (Julianne Nicholson) that she is going to enter training to be a nun. The new group trains under the rules laid down by their defiant Mother Superior, who tolerates no deviation of any kind. They are ordered to leave the outside world for an interior one, giving their love only to Christ. The comfort of human touch is forbidden, sign language replaces talking. That’s where the postulants and the audience are before Vatican II. Forced to explore the loss of thousands of churchgoers, Vatican II assembles to address the survival of the Church in the modern world that celebrates the exploration of ideas. And then, Vatican II addresses just that. When Mother St. Claire receives the new rules for the Church from Vatican II, she tears them up and continues as usual. Her insistence on the old ways and her denial of the new, contradict the beliefs of civilized society and of democracy. We watch the erosive effect of forbidden touch and enforced silence on Cathleen. Wherever any of our affiliations lie, the questions of the Church in the modern world are compelling. Genuinely fine acting lets us sink into thinking about the dilemmas. It is the majestic, if tragic performance by Melissa Leo as the Mother Superior that rivets us as she stands against her newly modernized Church. Margaret Qualley silences us with her quiet, serious performance as the devoted 17 year old searching for her future. Actor Denis O’Hare’s Archbishop, who delivers the news of modernization to the Mother Superior, is almost lighthearted in his calm acceptance and delivery of the new rules. Julianne Nicholson is tough but restrained as Cathleen’s devoted but worried mother. It’s hard to imagine anyone of any age who won’t be absorbed by the determination of this movie to explore the role of the Catholic Church in today’s world when all the obvious questions are presented to us with such skill. This review was posted on November 12, 2017, in Drama. Bookmark the permalink.